He was your grandfather and you are of his blood. He was very proud of you as he was proud of all his children and grandchildren. May Allahﷻ bless you and your parents. Allahﷻ is very merciful. Pappa went very peacefully and with great dignity and grace. His face was so full of Noor that it was as if he had a light shining on him. I had the honor of doing his Ghusl and Salat ul Janaza and burial as was his wish. Allahﷻ is truly merciful that he granted me this honor because until the day before he died, I was in hospital recovering from surgery and was discharged the night before on Thursday. He passed away the next day, Friday, January 5, 2007 at about 0800 am. His legacy to me was a book of Seerah – The Life of Muhammadﷺ by Haykal. I couldn’t have wanted a better or richer inheritance. Your grandfather was a wonderful man in many ways. If someone asks me what it is about him that I remember the most, I will say it is his habit of thanking Allahﷻ no matter what his own condition was at the time. I remember a time in our lives when we lived in one room in Aziz Bagh. Just one room with a bathroom and a tiny kitchenette which was created out of a little lean-to over what was the back door. This was because one of my mother’s cousins occupied her property, a flat that her father had built for her, without so much as a by your leave. But neither Pappa nor Mamma complained nor did they fight or disturb the harmony of the family. They left the matter in the hands of Allahﷻ. So in that one room lived Pappa, Mamma and all of us (3 adult children) except my brother (your father) who was in America and my sister who at that time lived with her mother-in-law. Not a cent of income except what Pappa was earning at the time, working at MESCO. But never did I hear either of them ever complain about their situation or ask anyone for help. Pappa never had any savings. There was enough for our needs but given that my parents were very generous with their family and with anyone who was in need, they never had any savings. Pappa never built a house of his own. Mamma had her apartment – or so she thought – in her grandfather’s house, Aziz Bagh. Pappa and Mamma were in Guyana at the time my grandfather, Mamma’s father, died. And that was the time that Mamma’s apartment was taken over. Pappa and Mamma expected to return to live in it but when that was taken over; they literally had nowhere to live. Mamma’s elder sister gave her one room from her own apartment which they lived in until we were able to expand it. May Allahﷻ grant Khalamani the best in Jannah for her generosity to her sister. The elders in Mamma’s family, especially her uncle Nawab Ruknuddin Ahmed and her cousin Hasanuddin Ahmed and many other members of her family tried their best to talk to her cousin to return the property but to no avail. May Allahﷻ reward all those who did their best to help to ensure that justice was done. In the end it is Allahﷻ who will decide on the Day of Judgment. Mamma however didn’t allow this incident to spoil her family relationships. Neither did my father say a word in the matter. They simply accepted the Qadr of Allahﷻ with grace and equanimity and lived with good relations with everyone. Big lesson for all of us in what it means to maintain family relations and to forgive one another even when you have been wronged. After all, when else do you have the opportunity to forgive, except when you have been wronged? Then Pappa got a job as the resident physician and administrator of Asra Hospital and they moved to Asra Hospital. I went off to work in the tea plantations in Anamallais. At that time my sister and her children returned from her mother in law’s home to live with Pappa and Mamma. So in the little 2-bedroom apartment on the first floor in Asra Hospital lived my parents, my sister and her three children and my other two sisters and a resident lady cook. But neither Pappa nor Mamma ever complained about this. They were delighted to have the little grandchildren with them. Especially the little one who would bend double and say, “Salaaamu alaikum”. Everyone was welcome. That is how families are supposed to be. A support for everyone who is in that family. Pappa and Mamma did not talk about that. They lived it and so we learnt the lesson. I remember very clearly – and that is the reason for the sense of loss I felt when he died – my brother or I would call him and tell him about whatever difficulty we were going through at the time and ask him to make dua for us. Invariably he would say, ‘Fikr mat karo. Mayin unku pakad laytaun. Diye tak nahin chodta.’ He wouldn’t even say, ‘Whatever Allahﷻ does is for the best.’ To him, the possibility of asking and not getting didn’t exist. My father was not an A’alim but his lack of formal knowledge was a blessing. His trust in Allahﷻ was simple and pure. It was not ‘contaminated’ by theological constructs and logical arguments. All right and correct in their own place but which often become curtains that cut us off from the pure reality that our Rabb can do whatever He wants and that whatever means whatever – beyond logic and possibility. After all Allahﷻ did say, ‘Yaf’alu ma yashaa and yahkumu ma yureed.’ (He does whatever He wants and He orders whatever He desires). So who are you to put limits on that? Hajj 22:18. See you not that to Allah prostrates whoever is in the heavens and whoever is on the earth, and the sun, and the moon, and the stars, and the mountains, and the trees, and Ad-Dawab (moving living creatures, beasts, etc. ), and many of mankind? But there are many (men) on whom the punishment is justified. And whomsoever Allah disgraces, none can honour him. Verily! Allah does what He wills. Ma’aida 5: 1………….Verily, Allah commands that which He wills. Ya Seen 36:82. Verily, His Command, when He intends a thing, is only that He says to it, “Be!” and it is! My father’s trust in Allahﷻ was like the trust of a little 2-year old child in its father. For that child the father has no constraints. No limitations to what he can do. The child can’t conceive of the father not being able to do what the child asks. So if the child doesn’t get what it asks for, it doesn’t reason, ‘Maybe my father can’t do it. So maybe I should stop asking.’ The child believes, ‘The only reason I am not getting what I am asking for is because my father is not convinced yet that I really need this thing. So I have to ask more and more and try to convince him and then he will give it to me.’ And so the child will not let go of his or her father’s robe and will hang on and cry and beg until it gets what it wants. That is how Pappa was. It never occurred to him that Allahﷻ wouldn’t give. And Allahﷻ never disappoints. So He always gave him. It is this connection to Allahﷻ that I consider to be my father’s legacy to me and to all of us, his children who learnt from him. And indeed this is supported by Allahﷻ’s statement in the Hadith Qudsi where He said, ‘Ana inda zanni abdi bih.’ (I am for my slave, as he expects me to be.) My father expected His Rabb to be merciful, generous and forgiving without measure and indeed He was. My father would say, ‘I ask Allahﷻ to give me a small hut near Him in Jannah. I don’t want the whole Jannah. Only a small hut near Him.’ That was his dua because he had a sense of who he was and who his Rabb was and what their relationship was. So dua for him was a time of great happiness and pleasure. He loved making dua. He thanked Allahﷻ all the time and told Allahﷻ his story like I would tell it to you. He talked to Allahﷻ with the total certainty that Allahﷻ was listening to him personally and paying attention and understanding every word he said. And indeed this is our Aqeeda. But for most of us it is Aqeeda as in the knowledge of the creed. For my father it was reality which didn’t even need to be said just like you don’t say, ‘I just spoke to my friend and he listened to me and understood what I said.’ You don’t need to say that. It is understood and expected. After all that is what friendship means. I believe this is what we have lost, most of us. This sense of the active, alive presence of Allahﷻ in our lives. Allahﷻ is remote for us – even when we ask Him. It is like we know Allahﷻ in our minds but not in our hearts. Not where we live and respond from. That is what we need to repair. All through my childhood there is one memory that stands out clearly above all others – the sound of Pappa in the bathroom at about 3.00 am every day. He would go there to make Wudhu for Tahajjud and in the days before plastics, when buckets were made of galvanized iron, he made a lot of clanging noises. Then he would pray Tahajjud and then recite Qur’an – we could hear his voice softly in the other room where we children slept until the time for Fajr when he would come into our room and loudly call out – As salaatu khairum min-an-nawm and would turn the lights on and pull off our blankets. On cold winter mornings that was definitely not something we looked forward to. But there was no choice. We had to get up, make Wudhu in cold water – because there were no electric water heaters and it was too early for the servants to light the samovar in the garden where water was heated on a wood fire. Then I would call the Adhaan and we would all pray Fajr behind Pappa. He used to call us We Seven. Our parents and their five children. And he took great pride in that. To the best of my knowledge Pappa never missed Tahajjud for over 45 years. He loved Tahajjud because he loved Allahﷻ. We did everything together. We would go shopping for groceries together to a store in Secundrabad called Swadeshi Store. We would go to another market also in Secundrabad to buy mutton and fish. The fish had to be live when you bought it to ensure that it was fresh. Mutton was priced differently by the cut and so you had to know what cut to ask for and which cut was good for which preparation. After all you couldn’t make Pasinday with chops. I would always ask the butcher for the scraps which he would gladly give in a newspaper which I would take back for my black Austrolop rooster who loved them and ate them with great relish. Chicken eating sheep, now that is a thought. I had a small poultry setup at home and we had fresh eggs and poultry meat from free range chickens which were colorful, healthy and had individual personalities. Many lived to ripe old chicken-ages and died a natural death as they had become friends and after all you can’t make a stew out of a friend. Pappa would always fill twenty litres of petrol in his car, a Fiat 1100. In those days petrol was less than Re. 1 per litre. There were hardly any cars on the road and no such thing as a traffic jam. We would go every week to the fruit market in Maozzam Jahi Market and Pappa would buy whatever fruit was in season always from one vendor – Sardar mian. He and Sardar mian would have a long conversation about all kinds of things ranging from politics, to the state of the nation to the problem of transporting fruit to the market over long distances. These were the days before refrigerated trucks and stores. So you could only get fruit in season. Once the mango season was over, for example, you had to wait until the following year to eat mangoes. By the calendar, first there were apples from Kashmir in January, followed by local grapes in February. Hyderabad was a great grape growing center in the 60’s and 70’s and was surrounded by vineyards. Then once summer started in April mangoes would start coming into the market – first the local Baiganpally and Himayat, then the mangoes from North India – Langda, Chausa, Dasseri. And of course Pedda and Chinna Rasaal, the cream of juice mangoes. This season lasted until the monsoon which began on the dot on June 7, every year. During this period at the peak of summer in May, watermelons and muskmelons would also come on the market. Not much came in the monsoon except bananas, including thick maroon bananas which have almost completely disappeared. After the rain we would get sapota, custard apples and figs and some very good guavas. Then we would be back in apple season. So there was much to do and we did it always together as a family. In the evenings every day, especially in summer, we would sit outside in the garden and Pappa would listen to the news on radio – All India Radio and Radio Ceylon to listen to Amin Sayani’s famous Binaca Geet Mala, dominated by Mohammed Rafi’s golden voice. At that time he would also turn the radio off and recite Allama Iqbal’s poetry of which he knew a great deal by heart and would explain a lot of the difficult verses to us. Mummy was his supporter in all this as her Urdu was better than his and if he got stuck he would ask her, ‘Tho is kay kya manay hain Beeba?’ (what is the meaning of this word?) and she would tell him. Then he would continue with the explanation that he was giving. He would discuss politics and economics with us, all of us under the age of 14 as if we were adults. One thing he was always very concerned about was the Palestinian crisis and many a time said, ‘I wish I could go there to help in the hospitals.’ May Allahﷻ accept his Niyyah to help the Palestinian people in their difficulties. I was always aware of a great sense of family togetherness and knew that it was his greatest wish that his children must all live together happily. Towards the end – and only now we know how close it was to the end – at the time he was experiencing it, he did not know how close he was to the end – he only knew that very rapidly his strength, mobility and eventually his consciousness, were all going. But when you asked him, ‘Kaise hain Pa aap?’ – his unfailing answer was a very loud and enthusiastic, ‘Alhamdulillah, bahut achcha hoon.’ (Alhamdulillah I am very well). He would say this to the point that when he was in hospital and the doctor came around on his visit and asked him how he was, Pappa would say the same thing with a big smile on his face. The doctor one day asked, ‘Then why are you here Doctor sahib? My sister, brother or I, whoever was with him at the time would have to say to him, “Pa, please tell him your symptoms.” He was one of the best physicians I have ever known with knowledge of clinical diagnosis that I have never seen in anyone else. In his time, before all medical imaging machinery, treatment was based on the soundness of clinical diagnosis and I don’t remember him being wrong in that. So he probably knew more about what was happening to him than the young doctor who came to examine him or more correctly to look at the scan reports without which he was helpless anyway. Eventually Pappa went home where he wanted to be. There was a period when he was sleeping most of the time. During this period when he was awake, he would simply lie apparently staring vacantly into space. One day he was lying that way when one of our aunts, (Tahira Apa) came and said salaam. He immediately responded, “Wa alaikum salaamu wa rahmatullahi wa barakatuhu.” It was his way to always respond with the full salaam. Then she said, “What are you looking at Anwar bhai?” He said, “Farishtay (Angels).” She asked, “What are they saying?” He replied, “They are saying – Nayk bano. (Become good). So even in that state he did not lose his sense of humor. His laugh was famous. You could hear it in the next house. He laughed with all his heart. His laugh was infectious and everyone laughed when he laughed and he spread happiness all around. When Pappa was happy you could see it in his whole body. When he was angry or irritated, you could see that also. There was not a single atom of Nifaaq (hypocrisy) in my father. I bear witness to that. He never said something with some other thing in his heart. That is a wonderful quality which Insha’Allah will stand for him when He meets His Rabb. That and his Shukr. I remember meeting him the day before he had the epileptic fit after which he went into a coma that he never came out of. At that time he was very drowsy and sleepy. But as always, he responded to my salaam and said, “Wa alaikum salaamu wa rahmatullahi wa barakatuhu.” When Samina and I asked, “Aap kaise hain Pa?” He said, “Alhamdulillah.” Those were his last words that I heard. Mamma said that thereafter even during his comatose state, at times when he sneezed he would say, “Alhamdulillah.” When he yawned he would say, “Astaghfirullah.” And at times he said, “La ilaha ill-Allah”. Allahﷻ stands by those who live for Him and love Him and He stood by Pappa to the end. Alhamdulillah. Before I close, let me tell you about your grandmother, my mother, who was married to him for 52 years. A marriage that was so good that they could not stay away from each other even for a few days. We used to live in Guyana when Pappa went to Canada on holiday. We were all living together at the time. He could not afford to take all of us and he and Mamma did not want to leave the children alone and go away. So he went alone. Three days later, he called. I answered the phone and asked him how Canada was. He said, “I am not in Canada. I am at Timehri Airport, please come and collect me.” We were all shocked. I drove the 200 kilometers from Kwakwani to Georgetown, Timehri Airport and when I met him I asked him what had happened. He said in a totally matter of fact tone, “I can’t stay without your mother.” So he returned from a 3 week holiday in 3 days and that too because it took that long to travel to and from Guyana to Canada in those days. It’s not that Pa and Ma did not have difficulties or disagreements. But they resolved them. They remembered the good of each other and forgave the bad. And in the end, the day after Pappa passed away, when I went to Aziz Bagh to spend some time with Mamma, she said to me, “I prayed two Raka’at Nafl Salah to thank Allahﷻ for giving your father such a wonderful end on a Friday in Dhul-Hajjah.” And when she said this, she was sitting in her usual composed, dignified way. That’s your grandmother for you. She lived with great dignity and died peacefully in the middle of those she loved on September 13, 2014. That is as she would have wished and I thank Allahﷻ for it. Mamma was a remarkable woman. Very petite and frail to look at but very strong internally. One of the most remarkable things that I remember about her is that I never saw her cry. I knew she did alone, before Allahﷻ but never in public. Even when Pappa died, she was the one who noticed that he has stopped breathing and called my sister who lived with them and told her. When I got there and when we had finished all the formalities of Ghusl and Kafan and were ready to take him to the masjid for the Salat ul Janaza which was to be after the Juma Salah, she came to look at his face for the last time and simply looked at him with great equanimity. No weeping or lamenting or anything of that nature. Not one tear. She understood life and death and she knew Allahﷻ and trusted in His Mercy. Dignity is the word that always comes to mind when I think of my mother. She was a very dignified person. She came from a family that was not only aristocratic but also very learned. Her father was the Director of the Department of Religious Endowments and twice led the Nizam’s Royal Hajj Delegation to Saudi Arabia as a guest of the King of Saudi Arabia. He was invited to participate in the Ghusl of the Ka’aba and was given a small piece of the Kiswa (cover) of the Ka’aba as a memento. One of her uncles was a High Court Judge. Another was one of the most powerful noblemen of the Nizam, the last Kotwal of Hyderabad – Inspector General of Police and First Class Magistrate. He was slated to be the Prime Minister of the Nizam but was bypassed for Laiq Ali as he was already an office bearer in the government and the Nizam didn’t want to pick anyone who was already in office. As an aside it is interesting to reflect on what would have happened if Nawab Deen Yar Jung had been chosen as the Prime Minister of Hyderabad instead of Mir Laiq Ali. My mother’s grandfather was Nawab Aziz Jung Bahadur, a great Islamic Scholar who had the title of Shamsul Ulama from the Nizam of Hyderabad. He built Aziz Bagh where both my mother and I were born. My mother was married to my father because Pappa was a doctor (my assumption). That is the only explanation that I can give for a marriage between two families whose backgrounds were as different as chalk and cheese. This was and is a highly unusual practice in our culture and for good reason. Pappa’s father, my grandfather was a guard in the Railways. He was the sole bread earner in the family but on that salary my grandmother and he brought up nine children. Four sons, one of whom died in childhood and five daughters. He educated his children and one became a medical doctor (my father) and another son (my uncle Asadullah Baig) who earned his degree in chemical engineering specializing in textiles from Germany, speaks German fluently and retired as the Asia Head for Ciba Giegy. My grandfather, all through Pappa’s medical education didn’t even buy himself a new shirt and spent his entire income only on his children’s education. My grandmother was herself a very dedicated and determined lady and ran the house and family with great patience, fortitude and focus. But all said and done, it was a very modest home with very limited means and absolutely no luxuries whatsoever. Yet all this was done without comment or talking about it. Working hard, sacrificing luxuries for long term development, investing in education and accepting whatever hardship that came with it was matter of fact in our family and not worthy of comment and definitely nothing to complain about. So Mamma went from living in a mansion with a three acre garden, tennis courts, servants and whatnot to living in a small house with a tiled roof, no ceiling, no fans, no running water and two rooms and a kitchen where food was cooked on a smoky wood fire. There was an inner courtyard which let in air and light and was used to dry clothes, grain and simply as a living room. This house was shared with her husband, his parents, two brothers and four sisters. Knowing the cultural and economic differences between her family and how she grew up and her husband’s family I can imagine that her married life in that family couldn’t have been either easy or pleasant but she stuck it out. In today’s times when people are ready to divorce at the drop of a hat on issues of compatibility – my parents were as incompatible as oil and water. Yet their marriage lasted very happily for 52 years until Pappa died. Later Pappa and Mamma moved out as Pappa worked for the Mysore Government in remote little towns in North Karnataka (Kanara). That meant that Mamma had to sometimes make a home out of houses which not only didn’t have running water, but many didn’t even have electricity. Water was drawn from a well in the courtyard and stored in large buckets in the bathrooms. In the evening kerosene Petromax lamps were lighted which attracted lots of insects. In one place, Mama told me, in the monsoon the light would attract large scorpions. Yet Mamma didn’t allow anything to frighten her. Instead she made these houses into homes that Pappa loved more than any place on earth. My grandfather (Pappa’s father) lived with us as he was very fond of his grandchildren and couldn’t bear to live away. He was another wonderful man who passed away while I was only nine. Not only did Mamma make a success of her marriage despite whatever difficulties she had to face, she maintained the best of relationships with her husband’s family and treated them with great generosity. Two of my aunts came to live with us permanently when my grandmother went to live with my father’s brother. They lived with us, got married, had children and moved out many years later. Mamma shared her time, space and money with her sisters in law and their families without even a mention of it. 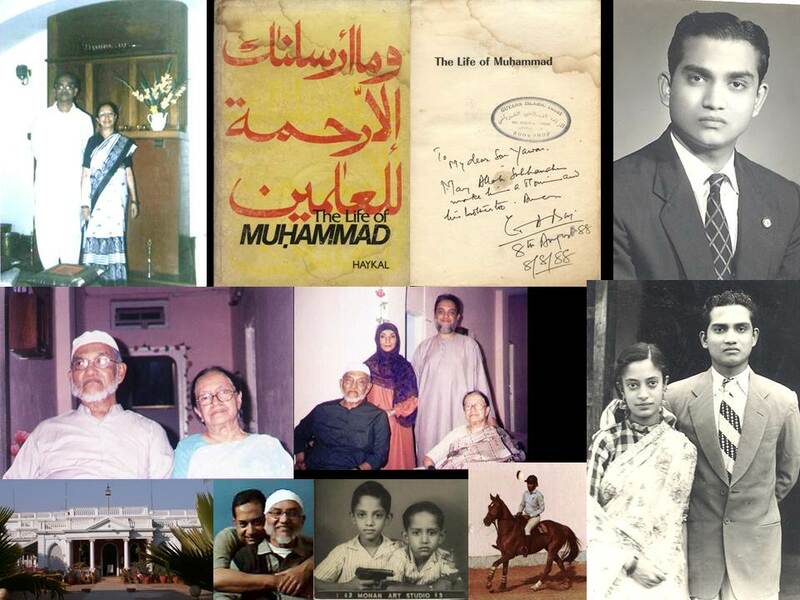 Mamma’s greatest contribution in our lives was that she taught all of us to read the Qur’an. She taught Pappa also because in his own single minded focus on becoming a doctor he had never learned to read Arabic and so when he got married he couldn’t read the Qur’an. Mamma taught him. And then when I came along, she taught me and all the others in their own turn. I recall how she would sit with a big copy of the Qur’an which had big bold lettering in black on a green paper – she always said it was easier on the eyes. She would follow the line with her finger and I would read aloud. She insisted that I didn’t mumble but that I read aloud in a clear, loud voice. She would say, ‘Let the trees and birds hear you. They will bear witness before Allahﷻ.’ After I read my portion, she would read the Urdu translation aloud to me. She spent a lot of time with me because I was the first born and for a time I had no competition for her attention. It was during that period, when I was perhaps a little over a year and a half old that one moonlit night she took me out into the garden of the house we were living in at that time, in a remote tiny town of Karnataka and pointed out the moon. Then she said, ‘Look at the moon. See how beautiful it is. We worship Allahﷻ who made that moon. We don’t worship the sun or the moon, we worship Allahﷻ.’ When people talk of spending quality time with children, I recall all these incidents – where our parents gave us almost nothing materially but in terms of their knowledge, spirit, thoughts and hopes, they gave us incalculable wealth. In those days liquid cash was in short supply and most middle class families lived on very little. Wearing hand-me-down clothes was more the rule than the exception. Everything was rationed including food but we never felt that in our daily lives as children. We had plenty of everything and the best of it. What our parents went through to give us that was never visible. My parents allowed us space to live. I was allowed to go off to spend my vacations with Pappa’s (and my) friend, Mr. V. Rama Reddy who had a small farmhouse on the bank of the Kadam River in Sethpally, Adilabad District. That meant that I would take a bus from Hyderabad to Nirmal; change for Khanapur; change for Pembi and walk the last four kilometers to Sethpally. All this when I was in class 10 in school. I would be gone for three weeks at a time and given that there were no mobile phones (or any phones) in Sethpally and no mail, my parents didn’t even know if I was alive or dead. Yet they didn’t stop me from going. Nor did they unload their worries on me. The result was that I learnt to take care of myself from a very early age and developed confidence which has stood me in good stead all my life. Pappa was almost fanatical about reading. He would read three books at once, usually in two languages. He would give me a book and tell me to read it and that he would ask me about it. Then when I had finished reading he would ask me, ‘So what is your view?’ If I attempted to tell him what the author said, he would say, ‘I know what the author says. I read the book before you. I want to know what you say.’ Then we would talk and argue about the book. He would listen, question, disagree or agree but always he would focus on what I was learning. Mamma got arthritis fairly early in life and so for the last perhaps thirty years of her life she became progressively less mobile. Her knees caused her a lot of pain and when we took her to an orthopedician to see if she could have her knees replaced, we discovered that she had such severe osteoporosis that the doctor said that operating on her was impossible. So she had to live with her arthritic knees and had to use a walker to move about. Moving from one room to another was a major undertaking. She visited me in my new house only once because just to get out of her house into a car was such a challenge that she simply didn’t want to attempt it. But through all those years, through all the pain, the restricted mobility and consequently restricted social life, I never heard her complain even once. That is the remarkable thing about both my parents, that they never complained about whatever difficulties they had to face. So Mamma’s social life went to almost nothing. She used to have her sisters visiting her while they still lived in the old house. Later when my sister moved to another place and Mamma had to move with her, even that stopped. But she always had a smile on her face. And that’s how she died. Pray for him. And pray for her. And remember them and what they taught us and practice these teachings in your own life. And pass on the message to your children and grandchildren, of obedience to Allahﷻ and of thanking Him in every state that you may be in your life. No complaints. Only Shukr. Pass on the message of thanking Allahﷻ not only in words but far more importantly in action – by being happy and full of confidence in the fact that you worship the One Who is the Creator and Sustainer of the entire universe. That would be the true tribute to Pappa and Mamma’s memory. And that would be something that would make them and their Creator most happy. Very touched by the story can be treated as a manual book for today’s newly married couple who have zero tolerance and so called compatibility issues. Also a great inspiration for parents like us whose children are in their early ages of 7 to 8 years . Thank you sir for sharing , I remember my own grandma and grandpa while I was reading the story who had similar qualities and attributes.